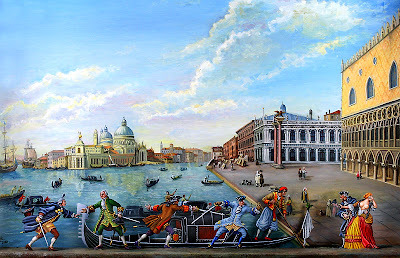 Another masterpiece of the French painter Serge Franzoia. 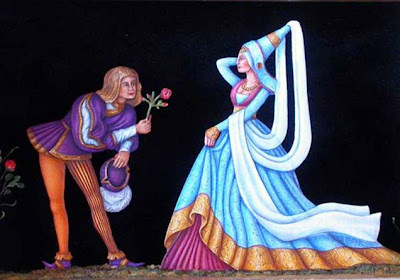 An excellent painted background with equally good painted figures. Observe how careful selection of vibrant colors can make the theme so eye-pleasing. For many flat figure painters, myself included, artist oils is the preferred painting medium. They are a versatile painting medium mainly because they have a slow drying time that enables to paint and blend colors and to create shadows and lights quite easily and with no rush. Also mistakes can be corrected easy enough, since you can simply wipe the paint of the figure and reapply it again. When painting with oils, always try to have a selection of various colors of the best quality you can afford. Personally I am using W & N artist series with an assortment of some specific colors from other brands. Below is a list of the tubes I consider as basic and from which all other colors can be prepared. Theoretically by combining these basic colors someone can produce literary any color or any hue available. 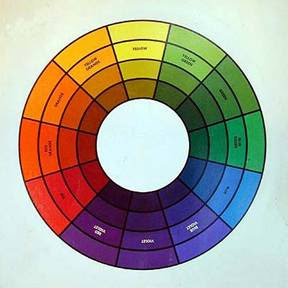 A great help can be a color wheel which shows what happens when two colors combine. Remember also what we said in the chapter about general thoughts of paint about complementary colors. 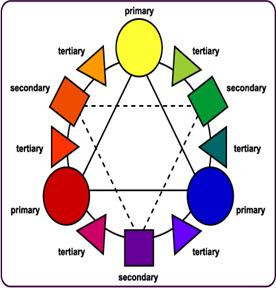 Some basic knowledge of the color wheel and some good use of it can produce virtually any coloring possibility available. In reality, we all have more colors than the few basic ones. More reds, blues, yellows and of course purples and greens. I haven’t mentioned metallic paints at all. Partly because I will discuss about them in a later chapter and partly because I prefer using grays and yellows for replicating metal. More about this later on. Whatever oil colors we have in our disposal is useful to know their properties, how they behave alone or in combination with other colors. Some are opaque, some are transparent so their coverage degree is not the same. While we can use an opaque color alone or combined with some other for basic coverage of a surface, we can use a transparent one, thinned as a glaze to change the tone of another surface. For example we can warm up a white tunic by a careful application of a yellow transparent glaze in one or two coats. Some are very strong like for example Prussian blue. Use them sparingly. When pigment comes out of the tube usually come along with the oil they are mixed with. Put a small quantity of the color you want to work with on your palette, (anything can work as a palette, I usually use a glass with rounded edges covered with an absorptive white paper), let it settle for a moment and then add, with the tip of the brush, some white spirit and mix thoroughly. Consistency of the oil should be like “ warm butter” as Shep Paine says. Apply it on the figure and then take the excess oil with a dry brush. Leave only a thin layer of oil color onto the figure. Now we are ready to add our shadows and highlights with some darker and lighter tones that we have either premade or we can do it straight onto our figure using a lighter or darker tone of the same color. Avoid white or black for this job. Although they are neutral colors they tend to alter our primary color. Careful blending of the edges with a dry brush is imperative so we won’t end with a sea of mud onto our figure. When figure is completely dried we can come back and enhance some shadow or highlight areas some more until we are satisfied with the result. 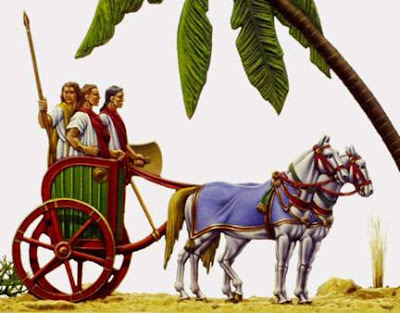 Hittite Chariot painted by Konrad Schulte. Usually oils dry after 24 hours or more and they are completely dry after some days. There is a shortcut though. If we place our figure under a light, in a reasonable distance from it, or into a specific for this job made oven , oils not only can get dry in a couple of hours but they loose their seen, a property that we are after when we paint material like woolen or linen cloth. Animals furs, especially live horses and leather have a natural seen, that oils produce with much success and without a particular effort. If we want this slight seen then we simply don’t “bake” them. Some people prefer matt finishes, some other a slight seen, an “egg shell” finish as they call it and still some prefer a glossy appearance. This is a matter of personal preference. Personally, I am going for a realistic finish. Some materials are mat, some have a seen. This is what I am after. “Snail Mail” figures from Detlef Belaschk painted by Jerry Mortimore. If you use the advantages and disadvantages of each color and manipulate them with some common knowledge and according our experience we can produce some very spectacular results quite easily. Well, as easily as a 30mm face, sleeve or boot permits…I want to stress out how important is the smooth, even covering onto the figure. If paint doesn’t “sit” onto the figure smoothly, since we are working in tiny areas of 30mm, even the slight imperfection will be visible to our finished figure. Always make sure, the color has the proper consistency before apply it onto the figure. Test it onto a scrap figure. Apply more than one coat if necessary and don’t rush it trying to finish a figure in 1 hour. Its neither a competition nor a race. We do it for the pleasure of the creation and of collecting flat figures. I know how difficult is not to rush finishing a figure. I am very anxious to see the finished result in every figure I paint but we need to resist the urge to finish it fast and work slowly and carefully for the best possible results. Observing carefully the selection of the accompanying photographs and putting what we have discussed so far on them, you can more readily understand how things work practically onto a figure. For specific properties and techniques for each color and for replicating flesh or specific materials like leather, metal, silk and others, a more detailed discussion will follow in the next chapters.